The July 2015 coal ash disaster in Vietnam occurred in late July after heavy rains resulted in the major flooding flooding in Quang Ninh province the north of the country. Major coal mines were flooded, a coal mine tailings dam burst, major roads in mines and connecting the mines to ports were damaged as were some coal port facilities. The breach of 'dam 790' resulted in coal mine tailings flooding through Cam Pha City with residents being evacuated. 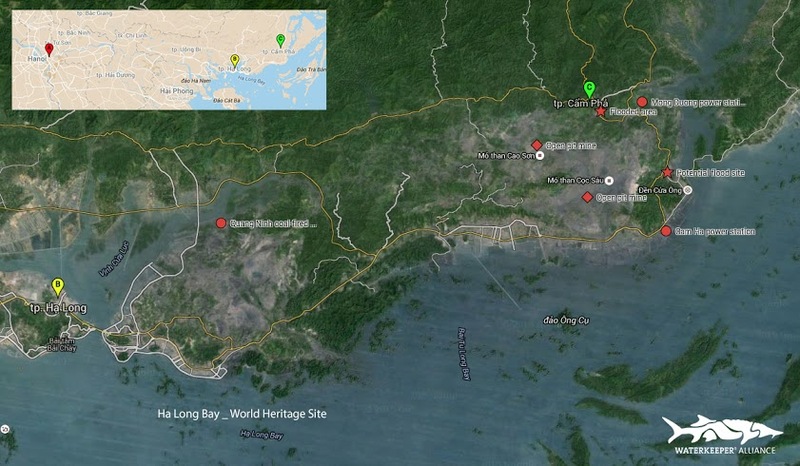 The coal mines and power stations are in close proximity of the Ha Long World Heritage site, with water pollution from the mines likely to affect the area. The floods and landslides that were triggered by the rainfall caused a number of deaths and resulted in widespread damage to houses, roads and other infrastructure. Viet Nam News reported that "the rainfall in Cam Pha township inundated many areas, such as National Road 18A and Cam Phu, Cam Son and Mong Duong wards, where water reached as high as the second floor of some houses." Authorities reported that 17 people had been killed in the floods and that a further six were missing. Four employees of the Hon Gai Coal Company were reported to have died in the floods. After only a short respite from the initial floods, heavy rain was forecast from between July 30 and August 4 in the northern region of Vietnam - especially in Quang Ninh, Hai Phong, Lang Son and Bac Giang Provinces. It was also reported that the floods has caused substantial damage to coal mining operations and transport infrastructure to the extent that coal supplies to coal-fired power stations were at high risk of being curtailed once coal stored at the power stations ran out. "heavy rains flooded coal mines of many companies of Vinacomin like Quang Hanh, Ha Lam, Mong Duong, and damaged coal railways in Cua Ong and Hon Gai Coal Selection... Most of the coal mining firms have halted production for several days." "In Hon Gai areas, two coal mines of Ha Tu Coal Company were completely submerged. Roads from Ha Lam and Ha Tu coal companies to the port of Lang Khanh were eroded. At Hon Gai Coal Company, heavy rains caused landslides on some internal roads and one of the coal grounds was covered with 2,000 cu.m [cubic metres] of soil from the broken Ha Tu damp [[sic - dump]." "In Cam Pha city, the operation of many coal companies like Coc Sau and Mong Duong was affected by heavy flooding. It was reported that these companies need 4-5 days to solve the consequences." The company made no mention of the impact from the collapse of the mine tailings dam on the residents of Cam Pha City or the environment. In the media release the publicly-owned company stated that the highest priorities were to restore roads system in Hon Gai - Cam Pha to enable coal to be transported to the harbour. EVN stated that it was aiming to provide 5000 tonnes a day of coal for transport to the Duyen Hai Power Generation Complex as well as 6000 tonnes a day for the Vinh Tan 2 power station. EVN reported that the Vĩnh Tân 2 power station only had enough coal stockpiles to enable it to run for 4.5 days. EVN stated that the Quảng Ninh power station had enough coal in its stockpiles to enable it to operate for one week, the Duyên Hải 1 plant enough for ten days and the Hai Phong Thermal Power Station sufficient to operate for 15 days. "floods earlier yesterday in Ha Lam Coal Mining Co.'s storage units caused the loss of 7,000 tonnes of coal. Other coal-mining companies also suffered heavy losses and damage to their infrastructure and machines. Despite the heavy rain and flooding, hundreds of local residents worked out in the open to keep the valuable coal before it drifted into the sea. But despite their efforts, the rain put a complete stop to all Quang Ninh coal mining operations. The province focused all its manpower and resources on saving the coal mines and preventing residential areas from being contaminated by coal and ash." Another news report - which featured numerous photos of residents scavenging coal tailings from the "5-12 stream" - stated that "recent major flooding washed millions of cubic meters of coal out of the storage facilities of local coal companies." The news report stated that on July 27 and 28 "thousands of tonnes [of coal] were collected." "Ha Lam Coal Company lost about 7,000 tons clean coal, which was washed away to streams and the sea. Two coal mines of Ha Tu Coal Company were completely submerged. Roads from Ha Lam and Ha Tu coal companies to the port of Lang Khanh were eroded. At Hon Gai Coal Company, heavy rains caused landslides on some internal roads and one of the coal grounds was covered with 2,000 cu.m of soil from the broken Ha Tu damp. Heavy losses also were incurred by the Quang Ninh Thermal Power Plant, with at least two coal warehouses flooded and a large volume of coal washed into Dien Vong River. Another report, published on August 1, stated that the publicly-owned Vinacomin - which is also referred to as TKV - had 6 million tonnes of mined coal in stockpiles but was unable to deliver it due to damage to transport infrastructure. It also reported that Vinacomin's coal mines in Quang Ninh suffered from equipment being submerged in the flooded mines. Its subsidiary, the Mong Duong Coal Company, estimated that its mines near Cam Pha City contained 36,000 cubic meters of floodwaters. Nguyen Van Tuat, the vice office manager of Mong Duong Company, said that the "all areas of coal exploitation of my company are inundated. It is planned that my company can resume working in three months." Following news of the flooding of coal waste through Cam Pha City concern was raised about the potential impacts of toxic pollution on residents, the local environment and the adjoining Ha Long Bay World Heritage site. The heavy rainfall and flooding events included the Cam Pha region, which has both coal mines and coal-fired power stations, as well as Cua Luc Bay which flows into Ha Long Bay. The area surrounding Cua Luc Bay includes a coal mine and both operating and proposed coal-fired power stations. Coal waste from mines and power stations can contain a wide array of materials dangerous to human health and the environment including heavy metals including arsenic, boron, barium, cadmium, chromium, lead, manganese, selenium and thallium. The Waterkeeper Alliance expressed alarm days after the disaster first came to light that there were new reports of "severe flooding inundating the Lang Khanh harbor area and Dien Vong river with fresh leakages from the Quang Ninh coal-fired power plant. This coal plant is located on the waterfront that connects directly to world renowned Ha Long Bay world heritage site." They noted that the Ha Long Bay is adjoined by 5,736 hectares of open pit coal mines and 3 existing coal fired power plants. July 26/27/28: Heavy rainfall causes widespread flooding, landslides and damage to property and infrastructure. July 29: Initial reports (in English) of coal ash dam failure. ↑ "Quang Ninh to repair flood damage after torrential rain", Viet Nam News, July 28, 2015. ↑ "Floods kill 17 in northern Vietnam", Tuoi Tre News, July 28, 2015. ↑ "Floods kill 17 in northern Vietnam", Tuoi Tre News, July 29, 2015. ↑ "Vinacomin suffers huge economic loss in the flooding in Quang Ninh", Vinacomin, July 30, 2015. ↑ 6.0 6.1 "31,000 soldiers on standby to cope with floods in northern Vietnam", Tuoi Tre News, July 31, 2015. ↑ "Vinacomin focus all resources to overcome the consequences caused by floods", Vinacomin, July 31, 2015. ↑ Electricity of Vietnam, "Mưa lũ lớn tại Quảng Ninh làm gián đoạn cấp than cho phát điện" Media Release, July 31, 2015. ↑ "Thermal power plants may face coal shortage", Viet Nam News, July 31, 2015. ↑ "Image: Quang Ninh people seach for coal in flooded stream", Vietnamnet, July 30, 2015. ↑ "Coal industry suffers $25 million in damages after floods in Quang Ninh", Vietnamnet, July 31, 2015. ↑ "Vietnam at risk of power shortage as coal mining halted by floods", Tuoi Tre, August 1, 2015. ↑ "Heavy Rains in Vietnam Cause an Avalanche of Coal Waste, Threatening Communities and Ha Long Bay World Heritage Site", Waterkeeper Alliance, Media Release, July 30, 2015. ↑ "Extreme weather event unfolds further in Vietnam with toxic spills and flooding now from multiple coal mine and power plant sites surrounding Ha Long Bay", Waterkeeper Alliance, August 1, 2015. "Quang Ninh to repair flood damage after torrential rain", Viet Nam News, July 28, 2015. "Floods kill 17 in northern Vietnam", Tuoi Tre News, July 28, 2015. Austin Ramzy, "Vietnam Floods Kill 17 and Threaten to Pollute Ha Long Bay", New York Times, July 30, 2015. "Vinacomin suffers huge economic loss in the flooding in Quang Ninh", Vinacomin, July 30, 2015. "Vietnam's July coal output rises 9% on year to 3.18 million mt", Platts, July 30, 2015. "31,000 soldiers on standby to cope with floods in northern Vietnam", Tuoi Tre News, July 31, 2015. "Thermal power plants may face coal shortage", Viet Nam News, July 31, 2015. "Coal industry suffers $25 million in damages after floods in Quang Ninh", VietnamNet, July 31, 2015. "Deadly rains deluge Vietnam mines, spark contamination fears", Thanhnien News, July 31, 2015. My Pham, "Deadly rains deluge Vietnam mines, spark contamination fears", Reuters, July 31, 2015. "Extreme weather event unfolds further in Vietnam with toxic spills and flooding now from multiple coal mine and power plant sites surrounding Ha Long Bay", Waterkeeper Alliance, August 1, 2015. "Flooded Vietnam coal mines leaking toxic slurry into World Heritage-listed Ha Long Bay: environmentalists", ABC News, August 1, 2015. "Vietnam at risk of power shortage as coal mining halted by floods", Tuoi Tre News, August 1, 2015.